Finally, right? I am SO ready. No, but get this, it is actually sunny today… and not snowing. Yes, yes, yes!! Last year it was a full on blizzard as I recall. I am kind of hoping that this year, since we have so much snow that it’s insane, that spring will be sunny and maybe not freezing. But I would take just sunny because when the sun is out around here, it just feels warm. Yesterday I do believe the brother with the broken neck (Creighton) actually did some laying in the sun, just for 20 minutes or so, but he actually got a little sunburned. FYI, I know breaking your neck is serious business, but he kind of has the life if you ask me. I mean, sitting in the sun, mid day, with nothing to get done. Sounds sort of nice. But anyway, what better way to welcome spring with colors! Oh, and lemongrass, which is a new and favorite ingredient for me. Ok, so truth be told, I don’t have a whole lot of words today. Actually, I feel like that has been the case all week, but I have never called myself a writer so I feel like this sort of thing is inevitable. We’ll just let the photos do the talking today. But, I do have to say, the flavors in this salad are spot on amazing. It is a deconstructed spring roll, so no rolling and easier eating. Plus, there are homemade crackers involved and we all know that makes everything a little more fun… and kind of delicious. Ok, just straight up delicious. For now, lets toast spring with spring roll salads! 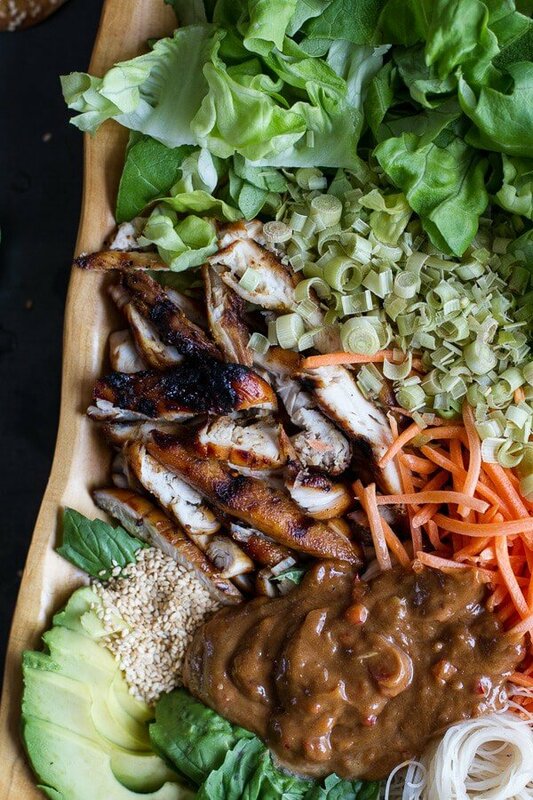 Deconstructed Vietnamese Chicken, Avocado + Lemongrass Spring Roll Salad. 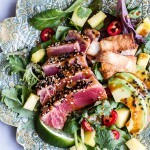 I do have to say, the flavors in this salad are spot on amazing! To make the dressing and chips. Preheat the oven to 375 degrees F. Spray a baking sheet with cooking spray. 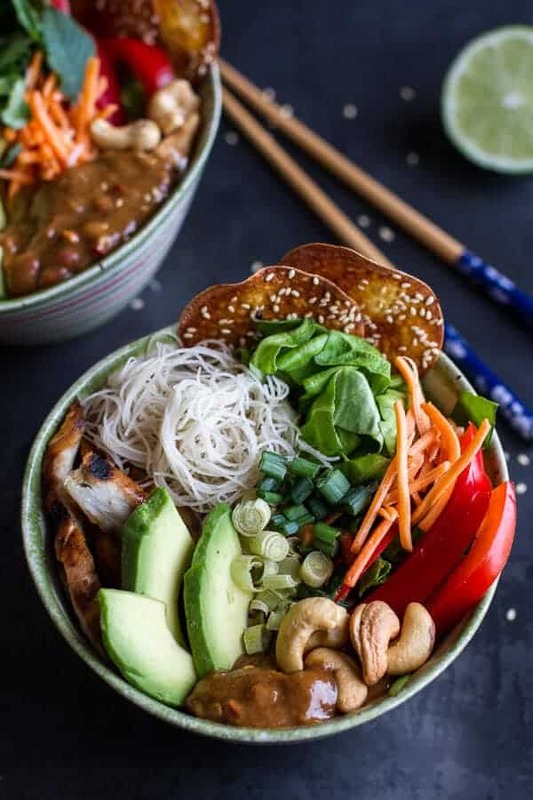 In a medium size bowl or glass measuring cup, combine the ginger, garlic, minced red chile peppers, hoisin sauce, rice vinegar, honey, sesame oil and fish sauce (you will add the peanut butter to the dressing later). Whisk well. Arrange the wontons in a single layer on the baking sheet (you may need 2 baking sheets). Brush each wonton with a thinish coating of the dressing and then sprinkle sesame seeds over the crackers. 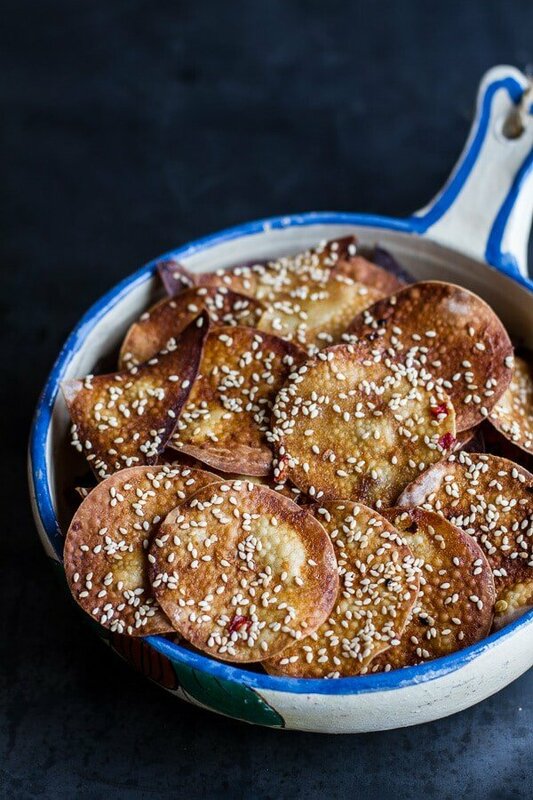 Bake for 8-10 minutes, or until the chips are crisp and golden. Remove from the oven and repeat with another batch if needed. Whisk the peanut butter into the remaining dressing. If needed thin with 1-2 tablespoons water. Set aside until ready to serve. In a medium size bowl combine the soy sauce, brown sugar, sesame oil, lime juice, curry powder, and garlic. Whisk to combine and add the chicken, toss well. Heat a skillet to medium high heat and add the chicken and all the liquids. Brown the chicken for about 6 minutes on both sides or until the chicken is cooked through and the sauce has reduced. Remove from the heat allow to cool and then slice into strips. You may also grill the chicken if desired. 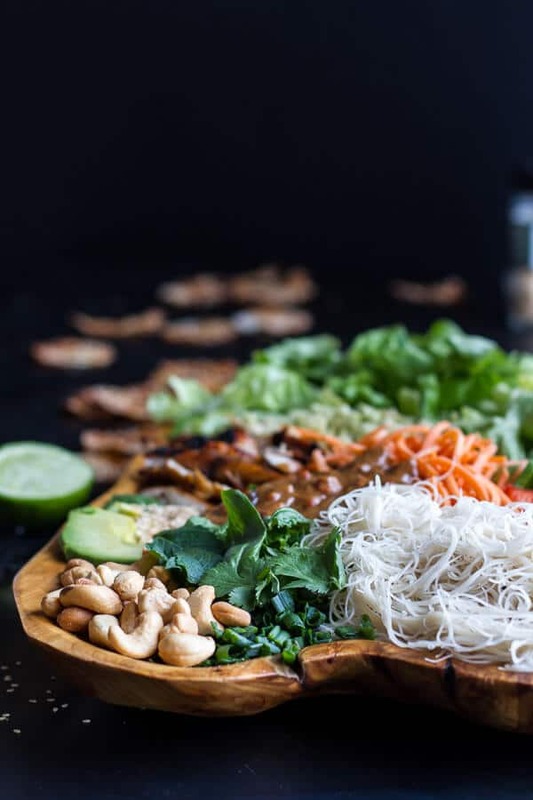 In a large bowl combine the chicken vermicelli noodles, avocado, carrots, bell peppers, chopped lettuce, green onions, basil, mint and cilantro, lemongrass, sesame seeds and cashews. 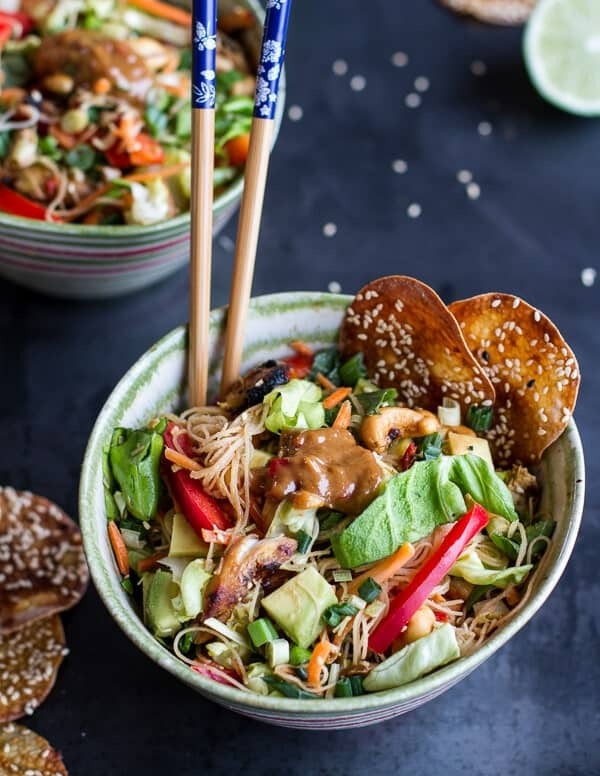 Lightly toss and add the dressing, toss again, divide the salad among bowls and serve with the hoisin sesame chips. EAT right away. 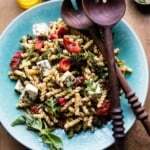 You can also create and assembly line of ingredients and create your own salads. And hopefully sunny skies too! That salad looks so good and just what we need on the first day of spring. I love the crackers can’t wait to try. I’ve never used lemongrass so it will be a new ingredient for me to try. Thank you! Hope you love lemongrass! I thought it was really refreshing! This looks like Spring! And I’m all about warmer weather and brighter colors! Love the crackers! I will be making this real soon, thanks Tieghan! Thanks Kathy! Hope you love this salad! This looks great. Unfortunately, my family would never touch something such as this. I would eat the snot out of it though! 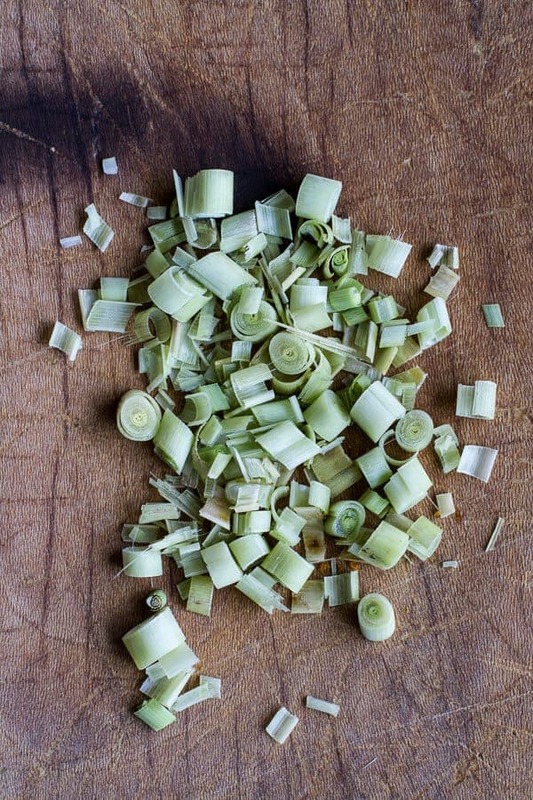 Where do you find lemongrass? Haha! Most of my family is the same way! LOL! I found lemon grass in the produce section at my local grocery store. It was with the fresh herbs. Hope that helps! You grow lemongrass!? That is so awesome. I wish I had a garden or at least lived in a place where is did not freeze every night throughout the summer! 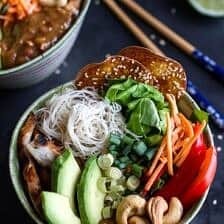 I made a very similar Vietnamese vermicelli bowl for dinner last night!! So so so good!!! This looks stunning! Thanks Liz! We seem to be thinking similar this week! This dish looks beyond amazing! Vietnamese food is the best! 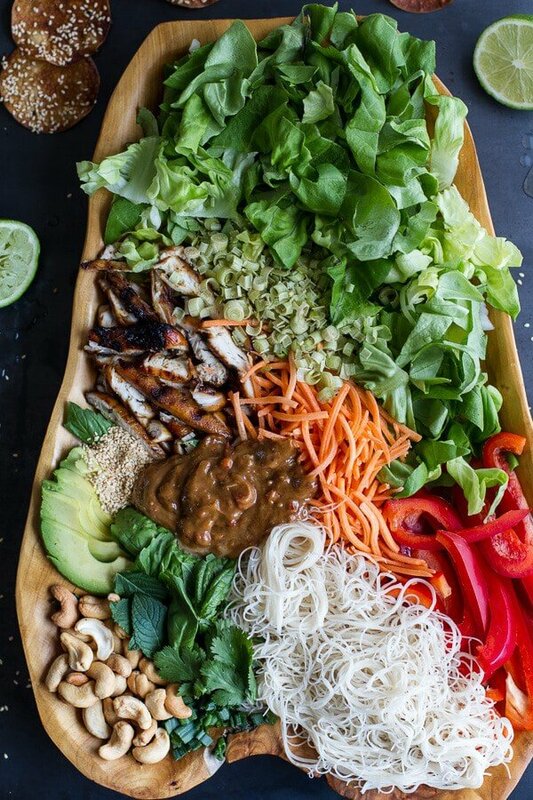 Wow, this salad looks so insanely good! I could just stare at the photos of all those ingredients all day long. 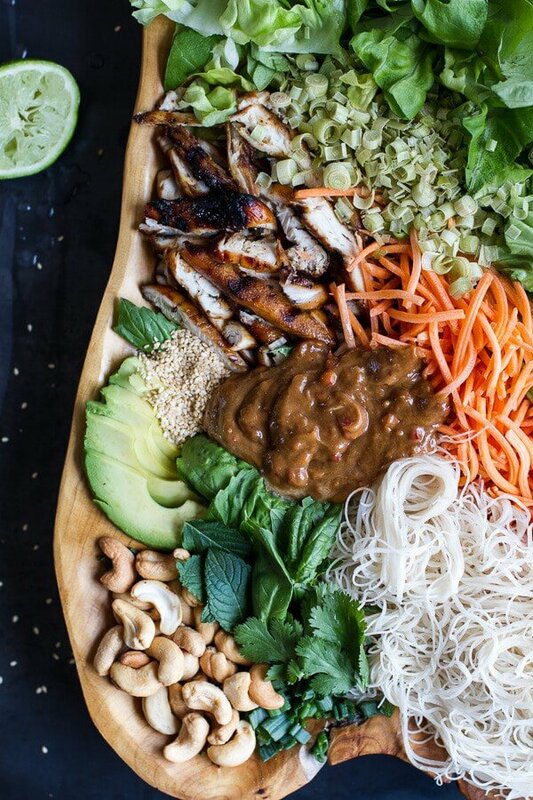 Love that you made an easier/salad version of a spring roll! I’ve never been so happy to see spring in my life!! This winter has seemed to drag on. Good gracious this looks incredible. Yum! This looks so delicious! I’m all about the southeast Asian foods, lately so this could;t be more perfect! 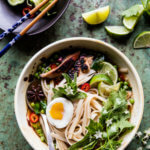 I just love all of those flavors, fresh veggies, hoisin, lime, ginger … and lemongrass. (I even grow my own lemongrass.) Such a wonderful meal – I wish I could have it for lunch instead of what I packed. Absolutely gorgeous, the perfect way to celebrate spring! This salad looks so good! and I can’t wait to hear your good news! We go out for Vietnamese food quite a bit and yours looks better than any I’ve ever been served! Thanks! So beautiful! I absolutely adore spring rolls. If you can get your hands on lap xuong sausage (chinese sausage), I’d recommend trying out a type of spring roll called “bo bia”… I bet you could make a pretty bomb salad out of it, too! I swear, you are my blogger spirit animal. Everything you make = what I want to eat like, yesterday. Happy Spring! SHUT THE FRONT DOOR. 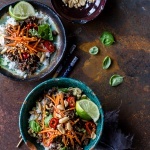 These look absofreakinglutely amazing – the perfect dish to usher in Springy Spring Spring! Love it. These are amazing. 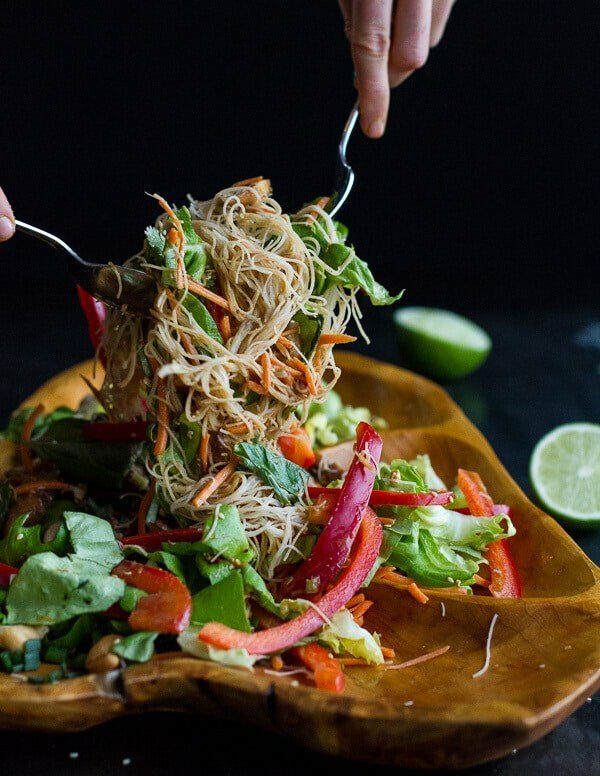 I adore spring rolls, and serving them as a salad is brilliant. I am with you on hoping for a sunny spring. We didn’t get rid of our snow until May last year. I like when it’s gone by March…which is not happening at the moment. Yeh! !Spring has started, I could know that from the photographs!! love It!! Happiness in a bowl! Happy Spring Tieghan! Beautifully Gorgeous Pictures! your pics are stunning and this looks delicious! Gorgeous! It looks like spring in a bowl. I like your wooden bowl too! I’ve been cooking for almost 50 years…most of them as a darn good cook- your recipe is one of the best things to ever come out of my kitchen. Thank you so much! PS. Lemongrass is very easy to grow & it keeps producing -the stalks from the grocery can even be rooted. Thank you!! So happy you love this!! Thank you so much! Hope you love everything you make! I made this for dinner tonight. I used pork tenderloin instead of the chicken, and since we are low-carbers, I did not use the noodles or the crackers. Regardless, there is so much flavor going on that I don’t think we really missed anything. The dressing in particular is to DIE FOR! YA! So excited you loved this and I love the pork swap. THANKS! I’ve made this salad twice now. It is soooo good I just can’t even! 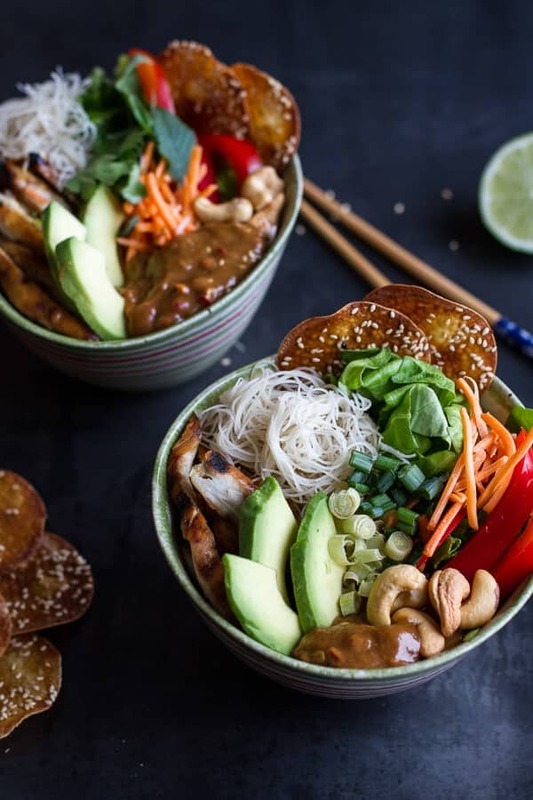 The combination of creamy peanut satay, crisp veges, the subtle spice of the chicken and the vermecelli noodles to mop up all the deliciousness is just perfection! I cant wait to impress guests with this at a summer dinner party! Where did you learn to cook? Incredible! Can t wIt to make this. I loved it, I’ll do it. Wow! Im just gonna try do it in this weekend! How many serves are those quantities? 🙂 thanksss! Hi! This salad will serve 4-6 people. Please let me know if you have other questions. Thanks! So happy to hear that! Thank you Marcos! It looks delicious, it even gave me the urge to eat. Thank you Raquel! I hope you enjoy this! I’m going to make this recipe right now, it seems to be super delicious. Thanks !! Great! I hope you love it! Thank you Manoela! I loved it, I’ll do it…. Great! I hope it turns out amazing for you!